Are you experiencing frequent tooth pain but not sure why? Perhaps you recently had a dental injury and you know you need to get to your dentist right away. Regardless of the circumstances, knowing you need a root canal is never considered to be an enjoyable realization, but sometimes it must be done. If the alternative means losing your tooth entirely, a root canal is more likely a relief than anything. That’s why your dentist is sharing a video that goes over the process briefly to help patients put themselves at ease before treatment. As bacteria releases plaque acids inside your mouth, it begins sticking to the many surfaces of teeth. After enough time, this bacteria can cause tooth enamel to break down, resulting in decay. After bacteria breaks through the enamel and dentin layers, it starts attacking the inner tooth area known as the pulp. At this stage, the tooth is extremely vulnerable to infection. The problem with cavities is you won’t feel them until they’ve already reached the nerve of your tooth, which is why daily care and biannual visits are so important. If you notice chronic tooth pain that ranges from mild to severe, experience a fever, or feel pain while biting down, you either have decay or an infection present inside your tooth and need to see your dentist as soon as you can. While less common, dental injuries can force patients to get a root canal. When a tooth is cracked or shattered, it exposes the inner tooth to oral bacteria. Instead of decay slowly breaking down enamel, an injury exposes it immediately. Once you’re stable after your injury and you’ve confirmed that the tooth is cracked, use a cold compress to apply pressure to your cheek, This will help reduce any swelling associated with the injury until you get to your dentist. Once you arrive at the dentist, they’ll examine your mouth and confirm that a root canal is needed, rather than a simple filling or crown to cover damaged teeth. The main purpose of root canals is to repair teeth by removing damaged areas of the tooth, including the pulp, cleaning and disinfecting the canal, then filling it with biocompatible material and sealing it. A crown is also placed on top to protect the treated area from future infections. 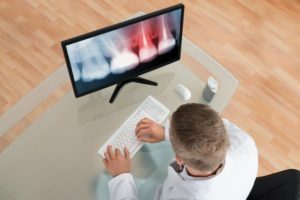 While many people associate root canals with pain, it’s technically not coming from the procedure itself, but more likely the pain felt prior to treatment. Pain after treatments feels more like a bruise instead of the throbbing sensation associated with an infection. When it comes to root canals, you’ll want to trust your dentist when she says you’ll prefer it over needing an extraction. If you’re experiencing chronic tooth pain, schedule root canal therapy with your dentist today! Dr. Deborah Romack earned her dental degree from the Baylor College of Dentistry and is a member of the ADA, the Academy of General Dentistry, and has participated in over 1000 hours of continuing education courses to provide patients the best case possible. To get your root canal therapy complete, contact her through her website. by: Dr. Deborah Romack at July 25, 2018 .